So! Here's what I got! It says, "Maximilian Joseph Langer, 55 years, 6 months, 8 days old," at least I think that's what the first part says. The next word I can make out is "Geestemuende," which is where the Langer family lived, and where he had lived for many years (again, what was he doing in Goettingen??). 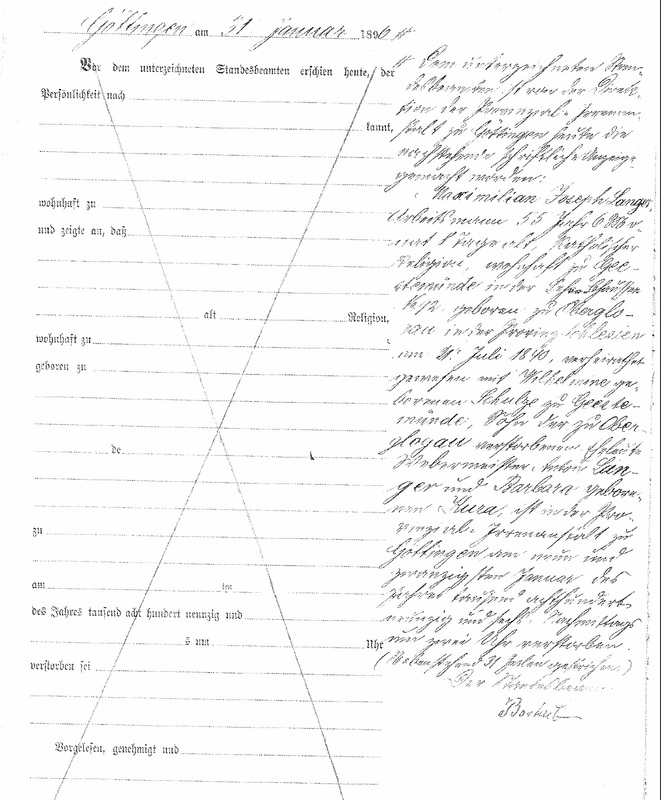 Next comes the information that he was "born in Oberglogau, Silesia, on the 21st of July, 1840, and married to Wilhelmine, born Schulze, in Geestemuende," and finally we get the information that his parents' names were "Anton Langer and Barbara, born Kura." I'm just blown away. There's a story in the parts I can't make out, I know there is, and I'm going to figure it out somehow. I'm dying to sit down today with the book I have on reading old German script and get busy, but I have classes to teach tomorrow and lessons that have to be planned, so it will have to wait. I will definitely send the 18 Euros, however, for a copy of the original document, since that is likely to be easier to read. 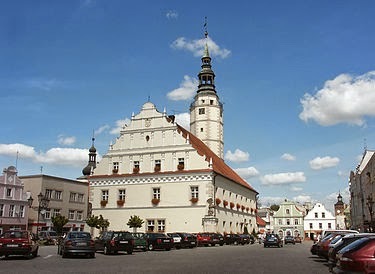 If you are moved to look up where Oberglogau is, you won't find it on a map of Germany any more -- it's now a town called Glogowek, in southern Poland. When Max was born, it was part of Germany, or Bohemia, under German control. I think this is also the region where Aunt Hilda was from, which is now part of the Czech Republic. But here's a picture (of course). Oberglogau is noteworthy for two things: 1) Ludwig von Beethoven finished his fourth symphony there, and 2) during WWII it held a Stalag (work camp) for British and Commonwealth prisoners. Since that did not have a good ending, I'll leave it to you to look up, if you're interested. So! Very, very slowly, we move back in the past of the Ortman/Berneburg clan. This breakthrough on the Berneburgs, though partially still a mystery, really excites me.